This tool is located on the Home tab ribbon in Microsoft Word. 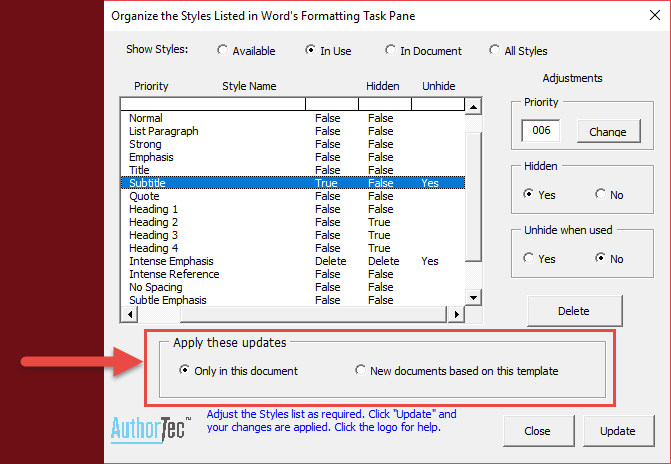 Use AuthorTec Manage Styles to organize the styles listed in the Styles Task Pane in Microsoft Word. or just the styles in an open document. Drag the dialog to a convenient spot on your display screen. TIP: Move the AuthorTec Manage Styles dialog box to the left side of your screen if you are also going to open Word's Styles task pane to access the Style Options. This will ensure that the Styles Pane dialog does not end up hidden behind the AuthorTec Manage Styles dialog. Styles shown are based on the choice made from the four Show Styles buttons. This list comes from all character and paragraph type styles that are in the document and attached templates. It does not include list or table styles. It shows all visible and hidden styles. If the attached template is a custom template, the list includes the styles from it as well as styles from Word's Normal template. Duplicate names do not display, even if their formatting is different. This list comes from all character and paragraph type styles that are in the document and in the document's attached template. Styles from Word's Normal template do not display if the attached template is a Custom template. The Hidden and Unhide style properties apply to what displays. If a style was at one time used on text in the document but later removed, the style name stays in the listing. This list displays only the character or paragraph styles that exist in the document. Only styles used to format text in the document appear in this list. This list shows all style types including character, paragraph, list, and table styles. It also shows styles marked as hidden. The source of the listing comes from the current document and attached templates, both custom and Word's built-in Normal template. and the Priority, Hidden, and Unhide properties assigned to each style. Use the Adjustments controls to make your changes. Priority setting modifications need a numeric value of 1 to 100. Styles marked as Hidden (value = True) do not display in the In-Use listing of styles. A hidden style will display when used if the Unhide property is set to True. Your changed styles are marked with a "Yes" in the 5th column of the dialog. Pull the horizontal scroll bar to the right. Changes to the property settings appear at once in the list. If you remove a style (Delete button) it stays in the list but notated that it is to be deleted. Only in this document: If you wish to only change these style settings in the current document, then use the "Only in this document" button. New documents based on this template: If you want to change the document styles and the same styles in the document's attached template, then use the "New documents based on this template" button. Click the Update button in the lower right corner of the dialog to apply your new settings. To discard all changes click the Close button. Learn more about working with styles by reading the articles about Styles in our blog at WorkFasterWorkSmarter.com These articles are written for you by Microsoft Word MVPs.